The prevailing low price of fine- and super- fine varieties of paddy has resulted in huge financial losses to the farmers who find sowing of these varieties a losing proposition this season. While addressing a function organised by Gurukul, Kurukshetra, on its entering the 100th year here yesterday, Haryana Governor Jagannath Pahadia said gurukuls had been playing an important role in the improvement of the social and educational environment since ancient times. The state Wildlife Department has banned the use of a blind hippo by Jumbo Circus. In a letter to the owners of the circus who are holding shows in Panipat from October 19 to October 25, the department said the permission to hold the circus could be granted only if the hippo, named Raja, was not used during the shows. The blind hippo, Raja, at Jumbo Circus in Panipat. More than 10 social organisations today organised a rally to urge Sirsa residents to celebrate pollution-free Diwali. Shah Satnam College of Education and National College of Education organised two rallies for a crackers-free Diwali. The farmers who had taken land on lease at the rates of Rs 25,000-Rs 35,000 per acre were in for a rude shock. The paddy prices this year were much below their expectations. The farmers who were expecting a bumper paddy crop with good per acre yield due to good rains were shocked when they harvested their crop. However, the farmers, who sowed PR and other varieties, were in a better position as compared to others who sowed 1121, ‘muchhal’, ‘sarbati’ and similar other varieties. According to reports, blight and other diseases hit the 1121 and other crops that affected the per acre yield adversely. When the farmers brought their crop to mandis, they were in for another rude shock as the market price of the fine varieties of paddy was much below last year’s price. 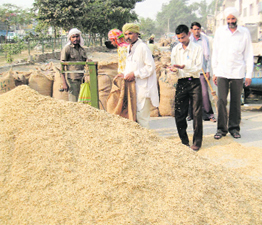 Though basmati is yet to arrive in the markets, the price of the 1121 variety ranged between Rs 1,600-Rs 1,800 which was Rs 2,200-Rs 2,500 per quintal during the last crop season. Similarly the price of‘mucchal’ prevailed at Rs 1,400-Rs 1,600 and ‘sarbati’ at Rs 1,300-Rs 1,500 per quintal, which were also much below the last year’s price. It is learnt that the exporters and other local buyers, who used to purchase the fine variety of paddy from the markets, were hesitant to enter the markets due to the prevailing government policies. Not only this, many of them were in possession of huge stocks of rice from last year’s crop and they could take not take the risk and go for more purchases from the markets that resulted into low paddy price. Buta Singh, a farmer of Patti Khot village, near here, said he had taken land on lease at different places at the rates ranging up to Rs 30,000 and he had expected a good return from the fine variety, but his hopes were dashed due to a low per acre yield and the prevailing low price of paddy. Some other farmers, including Santokh Singh, Ram Singh and Surjan Singh, said they were under a shock due to the prevailing market prices and the per acre low yield. However, some other farmers, who had sown the PR variety, expressed satisfaction over the price of Rs 1,200 per quintal but demanded bonus at the rate of Rs 200 per quintal for their crop. Pahadia said this institute, founded by Swami Shraddhanand on April 13, 1912, had been serving the humanity for the past 99 years. Affiliated to the CBSE, this gurukul was the only institution that coordinated ancient and modern education systems successfully. Efforts were being made by the institute to realise the dreams of Swami Dayanand Saraswati and Swami Shraddhanand, he added. Expressing his happiness over the physical and social activities being carried out in the institution for the overall development of the students, he said the students of the institute would bring glory in the fields of education, science, politics, sports and social service. Congratulating the Gurukul management, the Pincipal, the faculty members and the students, Pahadia said the institute was producing civilised and cultured citizens successfully. He also inaugurated the newly constructed Shaheed Ram Prasad Bismil sports complex on the Gurukul premises. In his presidential address, Haryana Lokayukt Pritam Pal said the Gurukul education system imparted overall development to the students while other education systems promoted only mental development. The department said the circus could use the hippo only if a team of the Central Zoo Authority of India, which inspected the hippo yesterday, would submit a report in favour of the hippo. The report is still awaited. According to Naresh Kadyan, Indian representative of the International Organisation for Animal Protection, an NGO associated with the UN Department of Information and the Haryana People for Animals, who had demanded appropriate action against the owners of the circus, the campaign against the use of the blind hippo, launched by Sukanya Kadyan, was yet to reach its logical conclusion as the NGO would not rest till the animal was rescued and sent to a zoo. Dr Sandeep Jain from Ludhiana, a former member of the Animal Welfare Board of India (AWBI), said it was a serious matter and should be looked into at the highest level. Activists of the Bhai Kanhaya Manav Sewa Trust, Suraksha Welfare Trust, Sarva Dharma Ekta Society, Purvanchal Sewa Samiti, Akhil Bhartiya Arora Pariwar, Agroha Welfare Trust, and some other local organisations participated in the rally. Gurdas Singh Insa, coordinator of Shah Satnam Singh College of Education, flagged off a rally organised by the students. Speaking on this occasion, Insan said global warming had assumed alarming proportions and burning of crackers on Diwali would only aggravate it. Carrying placards saying “Green Diwali, Clean Diwali”, “Patake Nahi Chalanyege, Paryavaran Ko Bachayenge” , the students marched through the town.